Spinning Pearls: Don't Wake the Troll! Don't Wake the Troll! 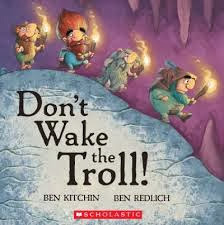 is a wonderful new picture book by Ben Kitchin, illustrated by Ben Redlich and published by Koala Books. The lively story tells of a group of dwarves whose treasure is stolen by a troll, so off they go to steal it back. The writing style is lively with plenty of word play and the illustrations are the perfect complement to the text. This is one of those picture books that has wide appeal. Very young children would enjoy the rhythmic text while older ones would find the story exciting. Reading-aloud adults will appreciate the themes of overcoming fear, solidarity and crime definitely not paying off...I especially love the last page! I'd love to see another collaboration between these talented creators. Let's hear it for The Two Bens!